Conductor Jeremy Silver wasted no time waiting for silence, starting the overture only seconds after the lighting had dimmed, and setting the pace for an exciting performance. He brought a bright, full, well balanced sound from the orchestra, confirming in my mind the acoustic function of the orchestra pit, which is to focus and project the sound into the auditorium. It was fantastic to hear the orchestra sounding as good in the Opera House as it does in the City Hall. The curtain opened towards the end of the overture, to introduce director Christine Crouse’s first touch of brilliance for the evening: the staff of Count Almaviva’s house were dusting, tidying, and lounging around the set! Silent comedy was a theme in the direction throughout the opera, and this is not only amusing but also authentic to the period. In Mozart’s day, “the masses” would have been entertained in equal measure by the music, clever story, and comic visual directing. Michael Mitchell’s set allowed for depth of movement on the stage, using walls at 45 degrees to the audience, (converging in a door at the back) and somehow also managed to convey the cramped attic feel of Figaro and Susanna’s room. A well timed last second scurry cleared the set by the last note of the overture. As the cast members make their entrances, it is apparent that each artist brings an individuality to their character. Thato Machona (Dr. Bartolo) has a wonderful rich baritone voice, with a powerful bass register. His claim for revenge was spine chilling. Violina Anguelov (Marcellina) is clearly a well experienced singer, and demonstrated a talent for comedy in her duet with Yakupa (Susanna). 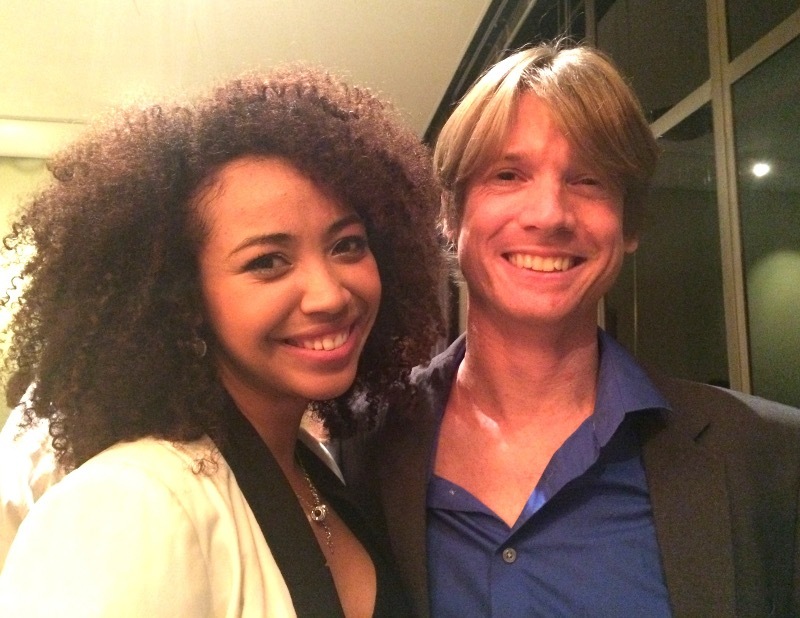 Lynelle Kenned (Cherubino) is a catch! She has a stunning voice, and she does her own stunts, fearlessly jumping and balancing on tables and chairs. Her duets with Yakupa were well matched, at a very high standard. Mandisinde Mbuyazwe (Count Almaviva) has a suitably commanding baritone voice, perfect for his role. Lukhanyo Moyake (Don Basilio) plays a brilliantly annoying, gleefully gossiping concert master. A lot of the first act is quite well known, frequently appearing on “Best of Opera” CDs, and it was immediately apparent that the standard of this opening night performance was on a par with international levels. Stevens’ (Figaro’s) famous aria “Non più andrai” matched up to any of the finest recordings available. The rising curtain revealed a breath-taking design by Mitchell and Kobus Rossouw (lighting) – an asymmetrical set, with vaulted ceilings, stunningly lit from two open bay windows on the left, overlooking a classical garden. Golda Schultz, (Countess Almaviva) in a stunning turquoise ball gown, was seated on her four-poster bed for the aria “Porgi, amor, qualche ristoro”. She has a voice like an angel – I was floating in my seat. She let Mozart take me to heaven. Lynelle Kenned’s aria “Voi che sapete che cosa è amor” was my second visit to heaven. The sublime nature of Mozart’s composing alone, is not enough – It requires the right delivery. Both Schultz (Countess) and Kenned (Cherubino) were outstanding in this regard: flawless intonation; soft sweet tone; and devastatingly powerful. The trio with Yakupa (Susanna) was rivetingly, merging beautiful vocal dynamics with action and drama. I was reminded that, today we have soap opera, and back then, they just had opera. All modern 4 o’clock TV – scandal, inappropriate flirting, this one is secretly seeing that one even though they are both married, and that one was under the bed and saw everything – is based on hundreds of years of exactly the same stories! Yakupa (Susanna) and Kenned (Cherubino) have a hilarious, brilliantly acted scene of stress and excitement, swapping places to hide in the Countess’ dressing room. Technologically, we live on a different planet – but socially nothing has changed since then. The directing of the real, ugly issue of domestic violence, was noteworthy. As the Count’s jealousy and suspicion push him to threaten violence, we are truly terrified by the prospect of Cherubino being attacked in a cupboard by the axe-wielding Count, and the moment of comic relief when he opens the door to find Susanna instead, is exquisite: Yakupa (Susanna), grinning from ear to ear, innocently saunters past the gob-smacked, jaw dropped Mbuyazwe (Count). The acting in this production, often a second priority in the directing of an opera, was excellent. We were at the edges of our seats, and this is only possible with world class musical delivery AND believable acting. Yakupa (Susanna) and Schulz (Countess) were adorable, sanctimoniously denying the Count forgiveness in devastatingly pretty thirds. The trio becomes a quartet as Stevens (Figaro) enters, thickening the plot, and reminding us of the title theme “Marriage”, which by now we have forgotten in the excitement. This quartet was another visit to heaven, with Yakupa, Schultz, Mbuyazwe, and Stevens. They were joined by the trio of Machona, Anguelov, and Moyake, and the act finished with a glorious septet, the orchestra at full tutti. Golda Schultz’s “Dove sono i bei momenti” was another trip to heaven. She truly is spectacular, (although the dress did help a little) performing with amazing vocal dynamics, and masterful control in her balance of sensitivity, sensuality, and power when she needs it. Designer Mitchell not only provided the dress, but also a genius transformation of the set by removing the screen that formed the front-of-stage office, to reveal the wedding hall, stunningly lit by Rossouw using not one, but two ceiling chandeliers. The set is a beautiful garden at night between pillars, at the centre of which is a fountain. We caught another glimpse of Anguelov’s talent (Marcellina) and comedic acting in “Il capro e la capretta”. Yakupa (Susanna) demonstrated beautiful use of her lower register in “Deh vieni, non tardar”. Schultz’s glacier-melting voice forgave the Count, reminding us that, in the greater scheme of things: “Triumphantly, only Love can end this day of turmoil.” With this message of inspiring redemption, conductor Jeremy Silver brought Mozart’s opera to a soaring, shining, magnificent close. This entry was posted in Opera Review and tagged #OperaReview, Andy Wilding, Marriage of Figaro Cape Town, Marriage of Figaro Review, Review. Bookmark the permalink.